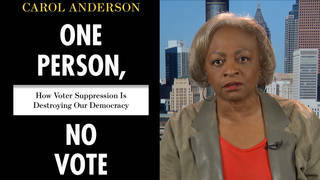 The Real Vote Rigging: Republicans Make It Harder for Millions to Vote in 2016 Election | Democracy Now! "Give Us the Ballot: The Modern Struggle for Voting Rights in America"
As Republican presidential nominee Donald Trump urges his supporters to be vigilant against widespread voter fraud and a rigged election outcome, we speak with Ari Berman, who argues in The Nation, “This Election Is Being Rigged—But Not by Democrats.” He says the true danger to American democracy stems from Republican-led efforts to make it harder to vote. This comes as the 2016 presidential election is the first in half a century to take place without the full protections of the Voting Rights Act. PRESIDENT BARACK OBAMA: I’d invite Mr. Trump to stop whining and go try to make his case to get votes. And if he got the most votes, then it would be my expectation of Hillary Clinton to offer a gracious concession speech and pledge to work with him in order to make sure that the American people benefit from an effective government. AMY GOODMAN: For weeks, Donald Trump has claimed the election would be rigged at the voting booth. The Guardian reports he has hired the former head of Koch brothers’ intelligence-gathering operation to run an election protection effort. On Monday, he said dead people and undocumented immigrants are voting. DONALD TRUMP: They even want to try to rig the election at the polling booths. And believe me, there’s a lot going on. Do you ever hear these people? They say, “There’s nothing going on.” People that have died 10 years ago are still voting. Illegal immigrants are voting. I mean, where are the street smarts of some of these politicians? They don’t have any is right. So many cities are corrupt, and voter fraud is very, very common. Meanwhile, experts say cases of voting fraud are very rare. One study by Loyola Law School found just 31 instances involving allegations of voter impersonation out of 1 billion votes cast in U.S. elections between the years 2000 and 2014. All this comes as this year’s presidential election is the first in half a century to take place without the full—without the full protection of the Voting Rights Act. Fourteen states—nearly all controlled by Republicans—also have new voting restrictions in place. For more, we’re going to The Nation magazine’s Ari Berman, who argues in his latest piece that “This Election Is Being Rigged—But Not by Democrats.” He says, “The true danger to American democracy stems from Republican-led efforts to make it harder to vote.” His book is called Give Us the Ballot: The Modern Struggle for Voting Rights in America. Ari Berman, welcome back to Democracy Now! ARI BERMAN: Good to see you again, Amy. AMY GOODMAN: So, you’re saying they’re rigged, too, very differently than Trump. ARI BERMAN: Very differently. What I’m saying is that the big threat to American democracy is from Republican-led efforts to make it harder to vote, things like strict voter ID laws, cutting early voting, making it harder to register to vote. I have been traveling to swing states like Wisconsin recently and seeing real evidence of people being turned away from the polls. So, I’m not seeing any evidence of voter fraud, but I am seeing lots of evidence of people who are being turned away from the polls by GOP-backed voting restrictions. So, to me, that’s the problem we should be talking about. We shouldn’t be raising ridiculous fears of voter fraud. We should be saying that people are being turned away right now because of laws that Republicans have passed. AMY GOODMAN: So, I mean, people don’t realize, but in states like Vermont, North Carolina, other places, many people have voted. They’ve been voting for a while now. ARI BERMAN: People have been voting. So, I was in Wisconsin recently. Early voting in Wisconsin started in late September. So, Madison, Milwaukee, Green Bay, the largest cities in the state, have been voting. Meanwhile, people have been going to get IDs that they need to vote, because Wisconsin is one of those states with a strict voter ID law. And 300,000 registered voters, which is 9 percent of the electorate there, don’t have strict forms of ID. And they’ve been going to get ID, and they’ve been turned away from the DMV. They are not able to vote. Meanwhile, the election has already started. So, to me, this is a national emergency. And instead of talking about voter fraud, which is a very small problem, we should be talking about the much larger problem of the fact that people who want to be able to vote, who are eligible to vote, are not able to. AMY GOODMAN: In Georgia, where they’ve just started early voting, they’re saying they have never seen anything like the turnout. They are saying people are waiting on unprecedentedly long lines. ARI BERMAN: Well, what happened in Georgia, in metro Atlanta, was they had one early voting site for the entire county. And this is why you have long lines. ARI BERMAN: In metro Atlanta. So, it was one county in Atlanta, but it was a very populated county. So, for example, during the Democratic primaries, we saw that Maricopa County, Arizona, had extremely long lines because Republicans there closed 70 percent of polling places. So, this is the kind of thing that people are concerned about, not just on early voting, but on Election Day. Will there be enough polling places? Will there be enough voting machines? These are the kind of things that can lead to longer lines and many problems on Election Day. AMY GOODMAN: The New York Times says Trump’s language has increased anxiety in minority communities, even though signs of a wave of Trump poll watchers has not yet materialized. Talk about this, his whole election protection efforts, bringing out the Koch brothers’ intelligence-gathering guy, hiring him to his campaign. ARI BERMAN: So, Trump has been raising these unfounded fears for a while, and he’s been using really outlandish rhetoric. First he said that law enforcement should monitor the polls in certain areas, which is illegal in states like Pennsylvania. Then he was saying you have to monitor the polls in the inner cities. He’s been talking about places like Philadelphia, Chicago, St. Louis. This isn’t even coded racial language; this is just explicit at this point. Supporters of his have called explicitly for racial profiling at the polls. They say they’re going to watch Mexicans, Syrians, people who aren’t speaking English. This was quoted in The Boston Globe. We now know that, as you mentioned, Trump has hired the head of the Koch brothers’ intelligence agency, who blew this New Black Panther story in 2012 totally—2008 totally out of proportion. So, it’s very dangerous. The one thing that I’m hopeful for is the Trump campaign is so disorganized that this won’t come to pass, that he’s telling people that he wants to recruit them as poll watchers, but the campaign has been in such disarray that hopefully it won’t come to pass. But if it did happen, if they really did try to challenge people at the polls specifically based on racial profiling, it could get very ugly on Election Day. AMY GOODMAN: So, talk—talk more about the fact that this is the first presidential election in over half a century without the full protections of the Voting Rights Act. ARI BERMAN: So, what that means in practice is that 14 states have new voting restrictions in place for the first presidential cycle in 2016, very important swing states like Ohio and Wisconsin and Virginia. These are states that are controlled by Republicans, by the way. So, if the vote was being rigged for Hillary, it would have to be Republicans that were rigging it, which is a ridiculous hypothetical. Instead what we’re seeing is that many of these officials are making it harder for Democratic-leaning constituencies to be able to vote. In Wisconsin, people are being turned away by their voter ID law. In Ohio, a million people were purged from the voting rolls. They were supposed to be put back on the rolls, but the state has resisted. In Texas, they are still telling people they need photo ID to cast a ballot, even though they don’t. So, there are a lot of potential issues here, and we’re already seeing problems during early voting in the run-up to Election Day. AMY GOODMAN: What are you most concerned about now, as the cases go through the courts and we see on the ground what’s happening all over the country? AMY GOODMAN: What do you mean the amount of time they have to vote is cut? ARI BERMAN: Meaning that states have cut early voting. So, in Florida in 2012, when they cut early voting, there were seven-hour lines, because people had fewer days to vote and there were fewer polling places. And that had a real impact on elections. We saw that in Ohio 2004, for example. So, I’m concerned that lots of people who want to be able to vote, who are eligible to vote, won’t be able to. I’m not concerned about the very, very, very small problem of voter fraud that’s been completely blown out of proportion. AMY GOODMAN: Trump supporters reportedly calling for racial profiling at the polls. The Boston Globe recently spoke to a man named Steve Webb, a 61-year-old carpenter from Fairfield, Ohio. Webb told the Globe, quote, “Trump said to watch your precincts. I’m going to go, for sure. I’ll look for … well, it’s called racial profiling. Mexicans. Syrians. People who can’t speak American. I’m going to go right up behind them. I’ll do everything legally. I want to see if they are accountable. I’m not going to do anything illegal. I’m going to make them a little bit nervous.” Ari Berman? ARI BERMAN: I mean, this is just an insane hypothetical. This is disgusting to me. It’s unconstitutional. It’s anti-American. How are you going to do this? In practice, how is someone going to do this? Are they going to go up to everyone who’s not speaking English as their native language? Are they going to go up to everyone who looks suspicious? These are the kind of things that happened during Jim Crow, where cops would patrol the polls in black neighborhoods, and they would prevent them from voting simply because of people’s race. So, the idea that in this day and age, in 2016, supporters are calling for racial profiling, egged on by one of the major candidates for the presidency, is really alarming and disgusting. AMY GOODMAN: The Republican voter fraud crusade dates back to the 2000 elections in Florida. That year, Florida wrongly purged thousands of voters from the polls. You talk about this extensively in your book. ARI BERMAN: Yeah. So what happened was, Florida is one of only a few states that prevented ex-felons from voting. And they claimed all of these ex-felons were on the voting rolls and needed to be purged. The problem was, first off, the purge was inaccurate. People were labeled as felons even if their last names, their middle names, etc., didn’t match the voter registration rolls. And the second problem was the purge was discriminatory, that African Americans, in particular, were 11 percent of the electorate in Florida, but 44 percent of those on the voter purge list. So what happened on Election Day 2000 in Florida, in addition to all the other issues, is that people were—showed up, they were wrongly told they were felons, they were prevented from voting. The NAACP sued the state of Florida after the election, and they found that 12,000 registered voters in Florida were wrongly labeled as felons and prevented from voting. That was 22 times George W. Bush’s margin of victory in the state, so it really was decisive in terms of the outcome. And I think some Republicans learned the unfortunate lesson from the 2000 election in Florida that small or not-so-small manipulations to the country’s voting laws could make a very big difference in close elections and that talking about voter fraud, whether or not the fraud occurred, was the way to build public support for these kind of restrictions. So, instead of saying we’ll never let this happen again, unfortunately, the 2000 election in Florida laid the groundwork for future voter suppression afterwards. AMY GOODMAN: And then, in Florida now, you have Hurricane Matthew, that really did a number on Florida, not as bad as they thought, but pretty horrific. Is it true that the governor opposed voter registration extension because people couldn’t register during the crisis? ARI BERMAN: Yeah, it was amazing. The governor was telling Floridians to leave their homes, but he wasn’t extending the voter registration deadline so they could register when they got back. And so, a federal court has extended the deadline. It closed yesterday in Florida. We’ve seen extensions that—we’ve seen voter registration deadlines extended in other states hit by the hurricane, like in Georgia and in North Carolina. It’s really outrageous that in the middle of a hurricane you wouldn’t extend the deadline. I think this really just shows what Republicans are up to here. AMY GOODMAN: Finally, the laws around felony convictions, around people serving time in jail? ARI BERMAN: Well, we now know that 6.1 million people won’t be able to vote in this country because of felony convictions. These are people that have served their time, that have been released, and still aren’t getting their most fundamental right to vote back. And there’s huge percentages of African Americans who aren’t able to vote in states like Florida because of these felon disenfranchisement laws. So this is really ugly, and it goes directly back to Jim Crow. AMY GOODMAN: We want to thank you, Ari, for joining us. ARI BERMAN: Thank you, Amy. AMY GOODMAN: Ari Berman, senior contributing writer for The Nation. We’ll link to your piece, “This Election Is Being Rigged—But Not by Democrats.” He is also author of the book Give Us the Ballot: The Modern Struggle for Voting Rights in America. This is Democracy Now!, democracynow.org, The War and Peace Report. When we come back, we look at an in-depth investigation, “The Police Killings No One Is Talking About.” Stay with us.